A busy week of filming so far. At the start of the week we buried Simon alive in a coffin with an iphone and a fake moustache. We allowed enough time at the end of filming to dig him up again. It's in his rider. 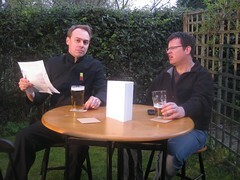 And then tonight Phil and Peter got together to film a sketch set a long time ago, in a beer garden far, far away. While surrounded by cats. Who won't make it into the sketch. And the noise of planes overhead - looks like we missed the volcano window there. We'll be editing all this and more for a set of sketches coming some time in late April/early May. Who'd have thought that buying a house could be on of the most terrifying experiences of your life? Phil from Missing Hen introduces this sketch that we shot in 2006, but only just finished. You can watch the sketch at blip.tv, YouTube, on Facebook, or subscribe to our iTunes feed or our Facebook fanpage.